Completely rebuilding a terminal is a massive undertaking in and of itself. 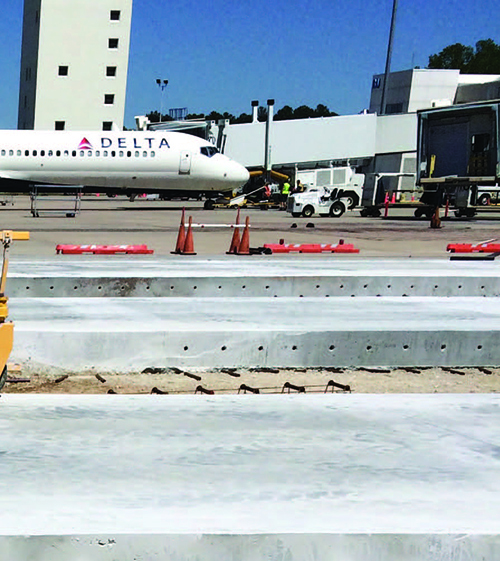 But Greenville-Spartanburg International Airport (GSP) recently doubled down when it replaced the adjoining airside apron and trench drain system during its comprehensive five-year terminal renovation. Ultimately, the strategy proved to be highly efficient for the South Carolina airport. During most of the apron construction, GSP shut down one gate at a time and coordinated schedules so work occurred simultaneously on both projects. One crew performed terminal renovations inside while another replaced the apron outside, near the same gate. “It took lots of communication between airlines, contractors and airport management,” says Howell. Concrete Slab Mfg: Tindall Corp.
Apron Reconstruction: GLF Construction Corp. In 2017, GSP enplaned about 1.1 million passengers and averaged 50 nonstop departures per day. Cargo operations include flights for the on-airport FedEx facility and several other freight carriers. The airport selected AVCON to design and manage construction of its apron project, which it completed in three phases. Phase 1—replacing the trench drain—was started and finished in 2014; Phases 2 and 3—the complete reconstruction of GSP’s concrete apron, lasted from 2015 through most of 2017. Total cost for the airside improvements (not including the terminal) was about $15 million, including consulting and engineering fees. FAA funded 90% of the project, and GSP paid for the rest out of its capital improvement budget. “We are very pleased we did not have to borrow any money to do these projects,” says Howell. According to Howell, the first phase was the most complicated. During Phase 1, contractors removed more than 1,700 feet of existing cast-iron trench drain and replaced it with a new concrete drain. “The original trench drain contained metal grates over a concrete trench. The expansion and contraction of the grate on the concrete edges caused the drain to fail,” he explains. AVCON consequently recommended a different type of drain. Originally, engineers planned to use a large poured-in-place concrete slab with slots cut in the top—a design that has been successful on a previous project. 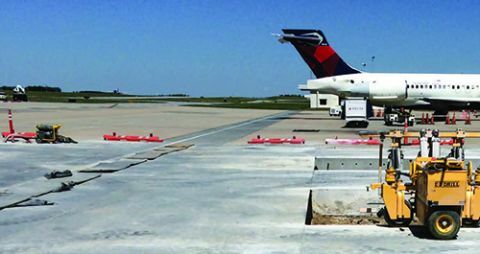 Instead, they improved on the design by specifying precast concrete panels that were custom-designed and manufactured to match the existing concrete apron joint pattern. Tindall, a company in nearby Spartanburg, manufactured the precast panels, labeled the position of each one, and delivered them to the jobsite in sequence. Hi-Way Construction installed a total of 144 panels on the prepared surface. During Phases 2 and 3, crews replaced the apron’s entire Portland Cement Concrete pavement, base and sub-base course. “We deepened the pavement section and added more concrete,” says Howell. The airport also opted to widen the apron by 9,000 square yards to allow more space between the two entrances for taxiing planes and ground service equipment. “This wider apron will be especially helpful during our busy times, and will ease congestion a bit,” he says. Phase 2, completed in 2016, included nearly 25,000 square yards of 17-inch P-501 Portland Cement Concrete pavement. Phase 3, completed in October 2017, included 29,000 square yards of 17-inch Portland Cement Concrete P-501 pavement. After the apron pavement cured properly, crews painted it based on the results of a gate utilization analysis. New aircraft lead-in lines include a variety of nose wheel markings to maximize the utility of each gate for various aircraft. Updated markings include ground service equipment hazard lines and engine ingestion zone markings for the 737-8s that a few airlines are beginning to use at GSP. 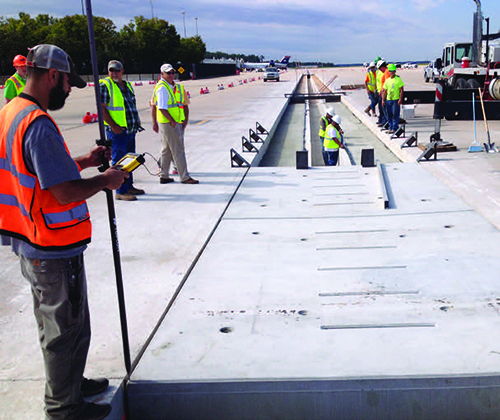 To date, the overall project has received accolades from airport staff and airline employees. “We are very pleased with the final product, and are confident our new apron and trench drain will hold up for many years to come,” Howell concludes.